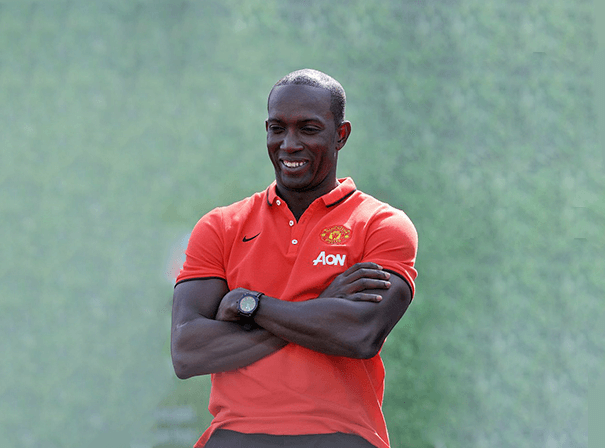 Dwight Yorke played a key role in one of the most recognisable Manchester United teams of recent times, and for that reason makes a fantastic after dinner speaker at sports functions, conferences or business events. Nicknamed The Smiling Assassin owing to the Trinidad and Tobago born man’s perma-smile and killer goal scoring instinct, Yorke participated in a record number of World Cup Competitions in his time: six in total from 1999. As well as being the manager of the Trinidad and Tobago national team until the qualifying matches for the 2010 FIFA World Cup were completed, striker Yorke played for Aston Villa, Blackburn Rovers, Birmingham City, Sydney FC, Sunderland and most notably the aforementioned Red Devils. With Alex Ferguson’s team, Yorke formed a famous partnership with Andy Cole, scored 47 goals in 95 games and picked up titles including the FA Cup, Champions League, Premier League and Intercontinental Cup. Because of his devotion to the game, a Soccer stadium in Tobago was named The Dwight Yorke Stadium in 2001 and since retiring, Sky Sports have snapped up the man on a two-year deal as a pundit. For an insider’s view on the Premier League, life at Manchester United and playing for – and managing – your national side, there are few with greater experience than the inimitable Dwight Yorke.